With tons of patterns and a quilt-like design, this Ketubah will truly stand out and command the attention in any room! 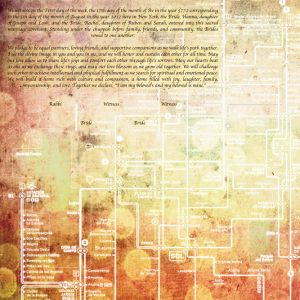 The Colorful Patterns Ketubah layers uniquely different square designs to create depth and tons of detail. The vibrant bright tones work together beautifully to really bring this Ketubah to life. The bending lines create space for Ketubah text and shape the design to bring all the eclectic patterns together seamlessly. 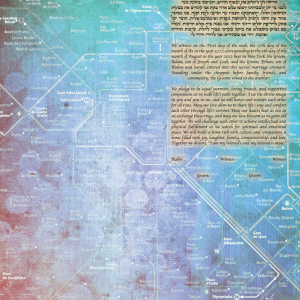 With each square of pattern, this Ketubah really comes together as a complete piece. 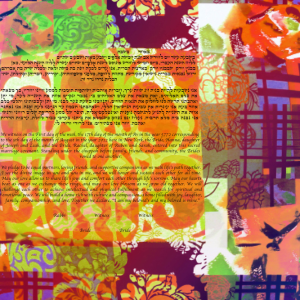 The Colorful Patterns Ketubah is perfect for the couple that loves the often overlooked and perhaps quirky things in life. This gorgeous design will reflect your personal style as a couple with importance and tradition. The Berlin U-Bahn opened in 1902 and as a result of it’s country’s past, is a great representation of dramatic political and social shifts pre and post World War II. The U-Bahn underwent many drastic changes when the Berlin wall was built — and then again when it was torn down. This German subway is also notoriously known for it’s gorgeous array of architecture — results of famous Swedish architect, Alfred Grenander’s evolving tastes. When connecting from one line to another, it’s been said that it can feel like traveling from one era into another. 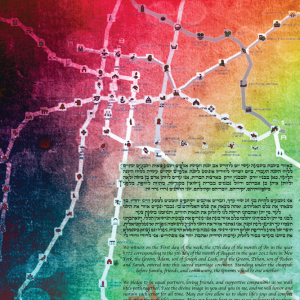 Wether you’re a history buff or a lover of maps and urban style, The Berlin U-Bahn Ketubah is a beautiful blend of modern art and evolving history. As America’s oldest subway opening in 1897, the Boston Subway is rich with history — fitting for a city that is already filled with beautiful culture, architecture, and important historical events. With various lines, the Boston Subway is home to the famous Green line, or what is locally known as “The T”. 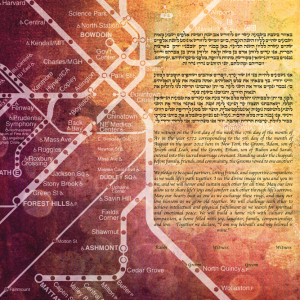 The gorgeous blend of light to darker tones with the subway map makes for a beautiful Ketubah that contains both modern elements and a unique style. 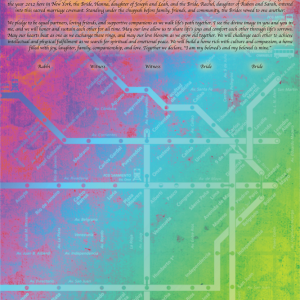 The Boston Subway Ketubah is perfect for the couple that not only have a love for contemporary urban style, but especially love the fun and unique Boston culture. The Chicago Subway system, famously known as “The L” dates back to the 19th Century and still maintains some of it’s original lines. After New York constructed elevated lines, Chicago followed suit and as a result it’s subway system has lines that run both above and below ground. 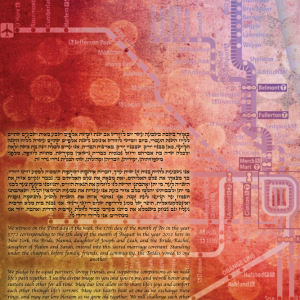 The Chicago Subway Ketubah exhibits a bold subway design highlighted by bright red and yellow tones. This Ketubah is perfect for the couple that have a special affinity for Chicago life and it’s beautiful history. Opened under the management of Compañía de Metro Alfonso XIII in October of 1919, the Madrid Metro was the first subway opened in Spain. The boom of urban influx and the economic increase helped expand most of the subway’s lines. However, until the early 90′s the investment from the central government into the subway system was so low that it wasn’t uncommon for children to ride the same train their parents rode decades prior. 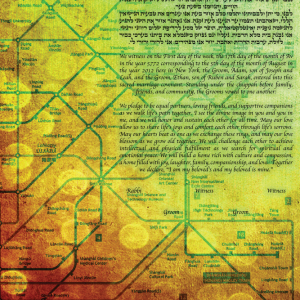 The Metro de Madrid Ketubah exhibits the subway lines highlight with a warm red and yellow design. This Ketubah beautifully captures Madrid’s warm and historically rich culture reflected through a sleek and modern design. Unlike many other cities, Mexico’s subway system was approved due to an interesting motivator — Mexico City would host the the 1968 Olympic Games. During construction of these subway lines, many important Aztec artifacts were found. Rather than move these artifacts, they built around them and even dedicated their subway stop names to these important discoveries. 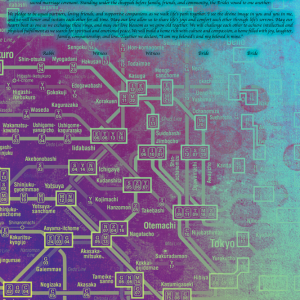 Mexico’s metro contains some of the most interesting historical details and architectural styles — making for the perfect subway Ketubah theme. The Metro De Mexico Ketubah is perfect for the couple that loves Mexico’s beautiful and extremely unique culture. Moscow’s Metro is an interesting reflection of Russia’s political history and how that blended with the world of art. First opening in May of 1935, Stalin opened Moscow’s metro as a method of displaying Soviet realist art. Art work seen in the original stations not only gained national recognition, but international attention as well. The architecture seen among the Moscow metro, although politically fueled, is some of the most gorgeous works of art seen in the history of the world’s metro systems. 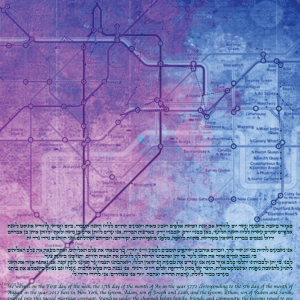 Thus making the Moscow Metro Ketubah a beautiful tribute to both tradition and gorgeous art. Originally opened in 1896, the Paris Metro is most known not only for it’s extensive lines, but also for it’s uniform architectural design. Heavily influenced by the Art Nouveau style and constructed under the direction of Fulgence Bienvenüe, the Paris Metro is one of the most beautiful transportation lines in the world. Holding true to Parisian style, the metro’s aesthetic has been upheld and preserved, even during renovations. 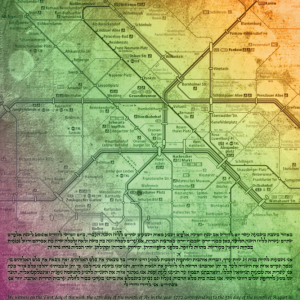 Le Metro Du Paris Ketubah is perfect for the couples that not only love city life, but specifically the beauty seen in Paris. This Ketubah reflects the best from both modern and vintage Paris. One of the most rapidly expanding subway lines in the world, the Shanghai Subway actually opened it’s first line in 1995. Unlike many other older subways throughout the world, many of Shanghai’s lines have a more sleeker and modern look. The Shanghai Subway is not only a success in it’s rapid improvements and continual updates, but is perhaps a great example of the consistent efficient success achieved by China. This Ketubah is perfect for the couples that love modern artwork that combines urban features with a fresh design. The Tokyo Metro’s first line was opened in 1927, and have been continually updated and expanded with more innovative and modern ideas. Much like a reflection of this beautiful Japanese city, their metro lines are extremely efficient, fast, and modern — especially given their city’s population. The Tokyo Metro Ketubah is perfect for those couples that not only love Asian culture, but love it’s history and style, expressed throughout Tokyo’s society. The London Underground, or what most know it as, The Tube is perhaps one of the most recognized and famous subways in the world. Seen in tons of movies and of course, famous for it’s iconic sign, The Tube has an extensive history and varying architecture and design. The Tube first opened in 1863 and includes the first underground railway system in the world. With influential architects such as Charles Holden and Harry Ford shaping this subway, The Tube is a beautiful example of society and gorgeous art blending together seamlessly. This Ketubah is perfect for the couple that adores British culture and it’s unique history. The first station in Buenos Aires opened in 1913, and since then has been characterized by the murals and artwork seen throughout it’s tunnels. A lot of this artwork is even considered to play a huge part in the artistic cultural heritage of Buenos Aires. Line A, one of the many lines that make up the Buenos Aires subways, is perhaps most known for it’s use of the original all wood coaches. 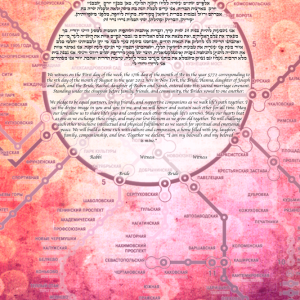 The Subte De Buenos Aires Ketubah is particulary special to us since we are based out of not just New York, but Buenos Aires as well. This Ketubah is perfect for the couples that love not just Buenos Aires life, but the Argentinean culture as well.